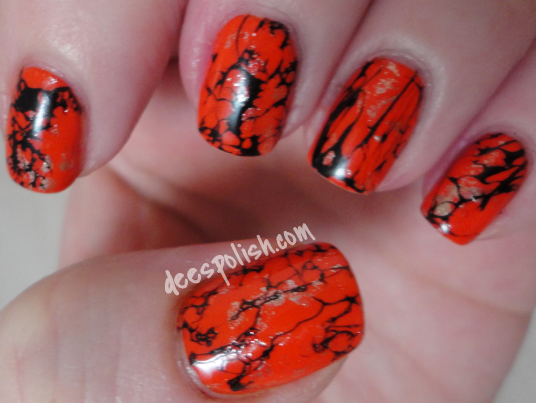 Day 2 of #31DC2014 prompts me to do orange nails.. now, in my original map out of ideas, my first five days were fruit/veggie inspired nails.. then.. I stumbled across some of the photos of those beautiful turquoise stone nails.. which quickly made me look at the day 4 prompt of green and say 'sold!'. Then it occurred to me that the process of making the turquoise stone nails could potentially look rad over other colours.. such as the colour orange. Why not, right?! 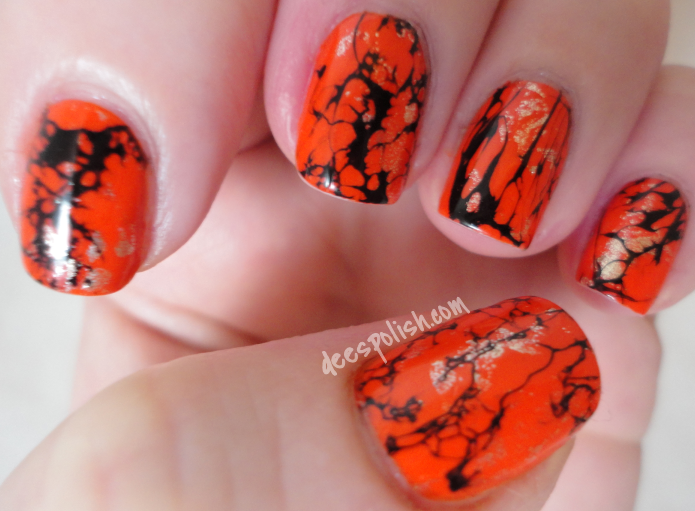 I started off with a base of my favourite orange, OPI A Roll In The Hague, on all of my nails. Then I took some China Glaze Midnight Kiss on a bit of cling-wrap and dabbed that on to my nails. I followed that step with adding a drop of FxFS Dark Matter into some room temperature water, then spritzing some hand sanitizer onto the polish and dipping my finger in. LOVE! I really like how all the nails turned out.. though the ring finger upset me at first.. but once it was all said and done, I enjoyed its presence with the others. I was actually really displeased to have to remove this. I would have sported this for at least a week! I can grasp this concept, yet water marble nails are still a myth to me. I am dreading day 20!